Two truly best friends. A weekend in the Alps. 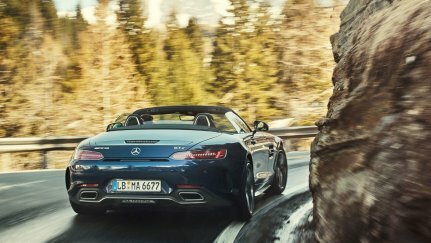 And the perfect companion for this adventure: A Mercedes-AMG GT C Roadster. The best thing that can happen to you when in search of freedom and happiness. It’s an insanely sunny day, but the two would have set off even if it had poured. With tents in the trunk, an analogue map in their hands and a huge smile on their faces. They hug one another, pat each other loudly on the shoulder. Male friendship is known to be based on rituals, and things are no different for Marc-Remo and Gian. It’s the last Friday in April and the two men are leaving for their road trip. For more than 15 years they’ve maintained this tradition. The last weekend of April belongs to them. Come what may. Nothing will be able to stop them until Sunday evening beyond the highest engine speed possible. As they have already done fourteen times before, they will follow the call of adventure from Zurich. And that is to not drive anywhere. To live in the moment. Drive for the sake of driving. Take off in order to arrive somewhere else. Try to escape everyday life, civilization. Without a smartphone. To be unreachable. To stay unreachable. To drift with the certainty of being able to attack and defeat any bend at any time. 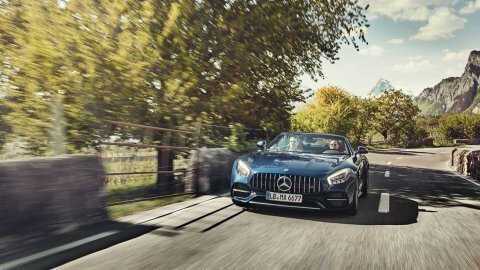 This year they’ve chosen the Mercedes-AMG GT C Roadster as their hero-mobile. 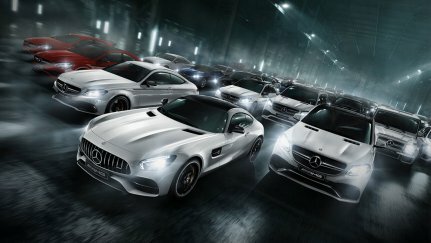 A 4.0-liter V8 biturbo, 557 hp, 100 km/h in 3.7 seconds. Brilliant blue metallic. Brilliant in every way. And yet they take things slow. First, they enjoy the beauty of the car. By ferry across Lake Zurich. They want the helmsman to give them a solo trip. He sneers at them for a moment, only then to sneak a peek at the Roadster. Okay, he’ll make an exception. But only this once. From Meilen to Horgen. And then keep tight-lipped about it forever, that’s the deal. The rays of the sun are reflected in the clear waters of the lake and for a brief moment throw a kind of spotlight on the sporty fender of the Roadster. But as the two friends lean coolly against the trunk, they deprive the observer of an attractive illusion: the vehicle as a perfect sculpture in a slow-moving exhibition on the water. After docking in Horgen, the time has come to really pick up speed. The Julier Pass in the canton of Graubünden has already cast aside its patches of fog. Marc-Remo straightens his sunglasses on his nose and quickly puts his hand back on the steering wheel. Gian rolls down the passenger window and stretches his right arm out towards the passing branches, without grabbing hold of them even once. The airstream tugs at their hair. The wide tires give the car the adhesion it deserves. The experience of the greatest possible freedom. Of pure joy. Gian watches his hand undulate in the wind, then briefly closes his eyes. The tight switchbacks alternate with sweeping curves and simply wipe away the pathetic straights of mundane life. 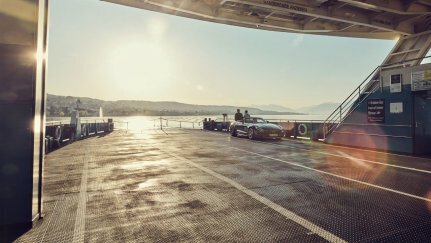 The Roadster tears forward, its suspension hugs the dry asphalt, the 680 Newton meters of torque provide the thrust that presses the two men’s bodies so firmly into the cockpit seats that they scream with joy. Let’s do it again! So once again down the Julier, back up and then down at the Lai de Marmorera reservoir, marking the perfect time for a cappuccino and the popular Bündner Nusstorte in the Ustareia agl Lai restaurant. 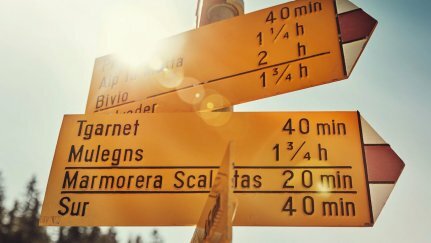 Before things soon take a vertical turn up the Bernina Pass. Its summit is located at 7,638 feet above sea level, and the signpost for “I was here” selfies is not long in coming. There’s got to be time for that. Marc-Remo and Gian have known each other since they were tots. Today they are 38 and 40 years old, have wonderful wives by their side, a child and a dog, obligations, insurance policies and a family calendar. They aren’t as spontaneous as they used to be. Everything is different from when they were at school. More compulsory than when they were studying for their degrees. More organized than when they were in their late twenties. The only thing that has endured between the two throughout all the changes of life is their friendship. 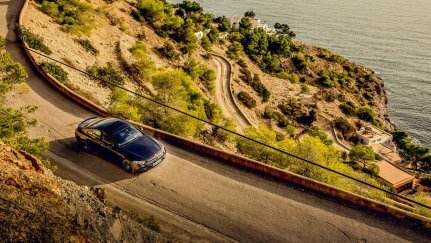 Out of the Burmester sound system’s speakers booms “Unforgettable” by Robin Schulz, interrupted by the soundtrack of the road. 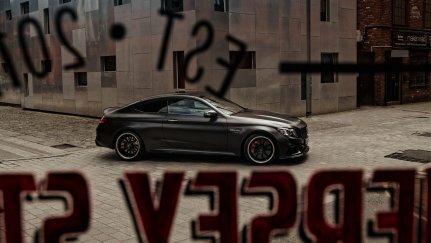 The rock faces here in the Alps do not reflect sounds softly, they mercilessly return the voracious roar of the eight-cylinder biturbo. Sublime. The vertices invite you to move in a new direction. To lean on the gas. To experience the moment. The friends agree: The nicest thing about driving a car is driving. Being on the road means, ideally, not arriving for a long time because you don’t have a clearly defined destination. And that’s what it’s about for these two. 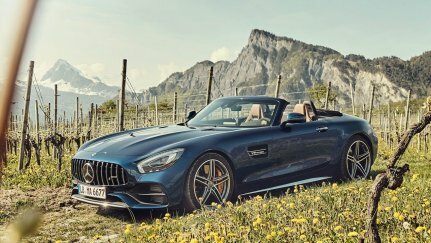 Only the setting of the sun indicates to the friends in the Mercedes-AMG GT C Roadster that it’s time to pitch their tents. How convenient that Lake Como is now only a few miles away, surrounded by impressive mountain scenery and 37 rivers, all of which flow into the lake. There Marc-Remo and Gian can breathe the Hollywood air, as, not far from their overnight accommodation, Villa del Balbianello stands on the tip of the Lavedo peninsula. For Casino Royale, the owners transformed the property into a clinic where James Bond, played by Daniel Craig, was able to recuperate with his Bond Girl. And in Star Wars: Episode II – Attack of the Clones, the villa on the lake served as an imposing backdrop. 6:14 am. The next morning. Sunrise. There are still 247 days before the end of the year. And while American actress and beauty icon Jessica Alba will be celebrating her 37th birthday in a few hours, Marc-Remo and Gian instead celebrate the Mercedes-AMG GT C Roadster. While it was still dark, they stowed their pop-up tents in the trunk, opened the convertible top, put 50 miles behind them. They enjoy the cool headwind and the power of the rear axle on the Maloja Pass. It might have been more than 20 bends; by now they’ve lost exact count. What they do know for certain is that they’ll be driving the pass a few more times today. Saturday, blue skies, sunshine and very little tourist traffic. Today, this here is paradise for any fan of sports cars. 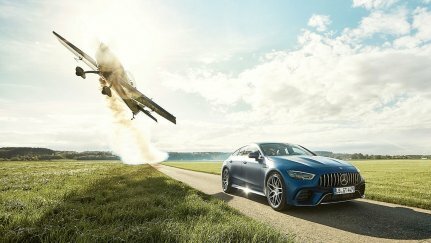 The sky is assiduously blue, as if it were enjoying the view from above into the cockpit. Only a few wisps of clouds are moving through the picture every now and then. Long, winding stretches alternate with tight bends. Marc-Remo is at an increasing loss for words and Gian begins to whistle with pleasure, in search of the right song for this road trip. It sounds like “Unforgettable” again.